Gone are the angles and lines of my geometric mani... and in their place? Some sparkle, a dash of flakies, a little jelly, and glitter, Glitter, GLITTER!!! Somehow this pic turned neonish all on its own....... Gremlins! Purple Pizazz is one of my faaaaavorite jellies to make sandwiches with. Sally Hansen could make a collection of jellies exactly like it, and I'd totally buy every single one plus backups. The nail polish world could definitely use more jelly polishes like this... just for the sole purpose of more Jelly Glitter Sandwiches. But I want them in more varying shades! I feel like we constantly get the same jelly shades over and over again. I'd love to see more of a variety, and I can't be alone in that camp. I'm sad that I have to take this off after just one day of wear... or do I? 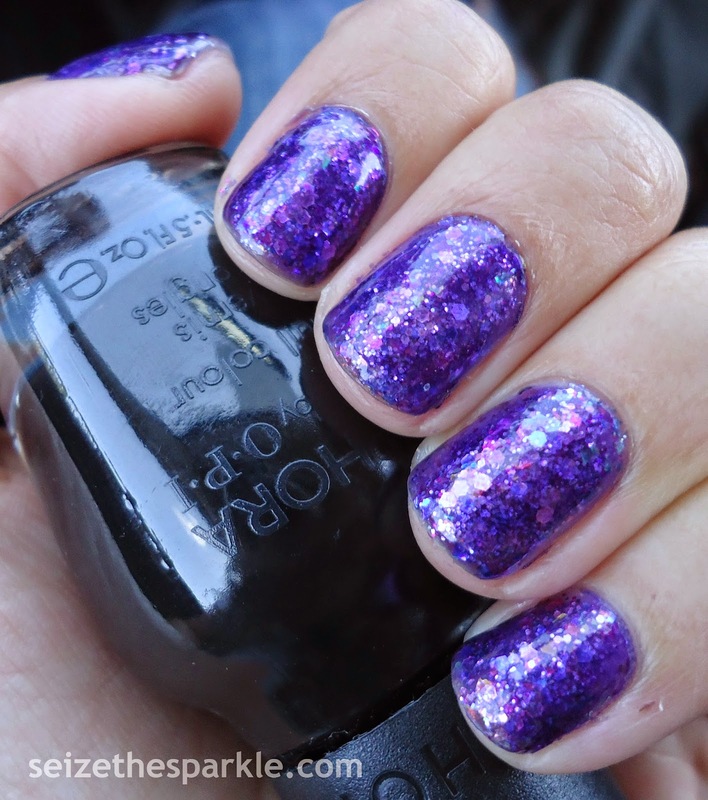 HALF MOONS are up next, and I could totally use this mani as a springboard for the next one. OR... I could start over fresh as a daisy. Hmmm... Which way will I go? Check back here tomorrow to find out! Oh, and Happy Weekend!! !